The blue rose has long been referred to by horticulturalists as the "Holy Grail" of the plant breeding world. 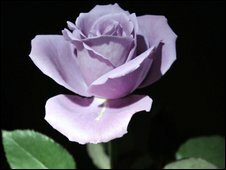 Now what is being described as the world's first genetically-modified blue rose is about to hit flower shops in Japan. A Japanese firm has announced it will be the first to put the unique flower on sale to the public - at a not-to-be-sniffed-at 2,000 and 3,000 yen (US$22 and US$33) per stem, about 10 times more expensive than normal. Genetically, there is no natural blue pigmentation in the rose to allow a true blue rose to be bred by conventional methods. Roses white and red are best. But in 2004, whisky distiller Suntory said it had succeeded in developing natural blue roses. With Australian biotech company Florigene, it said it spliced into roses the gene that leads to the synthesis of the blue pigment Delphinidin in petunias. The fruits of that 20-year research project will be delivered to the public next month. Talk of blue roses is not new. Faux blue roses were traditionally created by dyeing white roses. And nominal "blue roses" have been bred by conventional hybridisation methods. But, according to experts, these are more accurately described as light purple in colour. In 1847, American nurseryman Samuel Parsons wrote in his book The Rose that progress in science and technology might, indeed, enable gardeners to cultivate blue roses. If so, he said, they would be worth the effort. Rosebreeder Bernard Mehring says that as far back as the 1900s there was a German variety of "blue" rose known as the Veilchenblau. But the petals are, again, more a "mauvey-grey", he says, and it only flowers once. According to the Victorians, who promoted floriography - the language of flowers - blue roses signified mystery or the attempt to attain the impossible. Since those times the colour of a rose has represented a different sentiment or feeling. 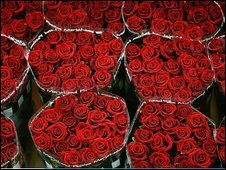 Passion and romantic love is still associated with red roses. Pink roses apparently imply a less passionate affection - rather a more gentle or poetic one. White roses signal sincerity and purity, while yellow roses stand for friendship. Sarah Holland from the Flowers and Plants Association in the UK says she believes natural blue roses "would be hugely in demand". 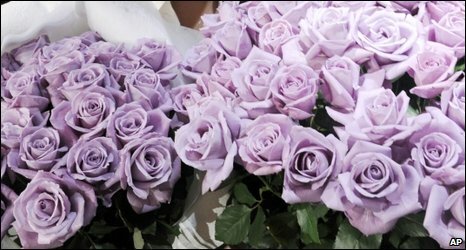 Dyed-blue roses, which are also a soft purple colour, sell well in the UK, she says. "They don't appeal to everyone because they are unnatural, but there is definitely a place for them. They are, for example, popular for weddings." Her association receives lots of inquiries about black or blue roses every year ahead of Valentines Day, she adds. "Roses may be ubiquitous nowadays, but they haven't lost their meaning and people are always looking for something that is unique." Helen Bostock, a horticulture advisor at the UK's Royal Horticultural Society, says that while a true-blue rose sounds fabulous, it could stand out like a "sore thumb". "A natural blue rose would signify something that is expensive and rare. It would signify exclusivity. "It has been the Holy Grail to rose breeders, but, personally, I think it would look odd - a bit like a plate of blue chips." She is doubtful that a blue rose would be anything other than a novelty. "A red rose signifies passion, but blue is a bit cold in my book." Breeder Bernard Mehring is also unimpressed by the news of the blue rose. He has managed to breed a black rose, but says that if you tried to grow it in the garden the sunlight would cause the petals to shrivel up. He thinks the blue rose, for different reasons, would be no good in the garden. "I can't see that a natural blue rose would be easy to grow." Its cultivation would not be allowed in some countries, such as the UK, because of the controls imposed on genetically-modified plants. Roses have been the subject of many myths, legends, poems and paintings. Our fascination with them stretches back centuries. The Romans loved roses. The Emperor Nero was believed to have had an extravagant rotating banquet hall in which rose petals cascaded from the ceiling. And Napoleon Bonaparte's Empress Josephine instructed collectors to send her roses from around the known world, even during the Napoleonic Wars. In Japan, where the act of present-giving is highly ritualistic, the new blue variety, Applause, will be marketed as a "luxurious gift for special occasions such as wedding anniversaries". There are no current plans to sell the new variety overseas, which might not be a bad thing, according to Mr Mehring. He warns that in some countries blue is not a popular colour for flowers. "In Italy, the blue is associated with mistrust or bereavement," he says. In China, however, according to one Chinese folk tale, the blue rose signifies hope against unattainable love. What do you think a blue rose would signify? Add your comments on this story, using the form below. But it's not Blue, it's Lilac? So it's either back to the drawing board, or off to the Optician for you lot! Okay not very good, but neither is the so-called "blue" rose which looks distinctly purple in the photos. I think I'd ask for my money back. When I was a young teenager my first "silly love had died", I cried and I mourned. I asked him to speak to me from beyond the grave, as I prayed that the beautiful connection between us had not been lost. I thought that if I received a rose that day I would know it was a sign that he could hear me. "Seeking roses from the arms of death". While at work later that day I received a large advertisement in the mail with large blue roses all over the page. I felt it was a sign as only he could send me blue roses, as it was a color of rose that did not exist on earth. I wish I had known of Kipling's poem back then (and thank you for sharing it with me now). From this personal experience, I agree with the Italians that blue roses symbolize bereavement, as I was consumed with grief. I was attempting to "attain the impossible" communicating with the deceased, and was obsessed with the "mystery", of life and death, exactley as the Victorian floriographers believed the blue rose to symbolize. Now, I am ready to believe in the Chinese folk tale symbolism of the blue rose, "hope against unattainable love" and that someday I will be with my Silly Love again. The Applause seems to be soft purple. Should be called purple rose? Historically, purple is religion oriented, something sacred, however, there isn't a universal religion. Roses are a thing of beauty and scent in their natural state from the richest and deepest reds to the many gold yellow and salmon color to white. They all evoke purity and warmth; I can't imagine blue could do a better or more joyous job! "Signify mystery or the attempt to attain the impossible..." Awesome. That's what I'm always trying to do! I'll definitely get her some. I think that actually having blue roses, rather than them being an impossibility, has taken out all the mystery. One year someone will invent the last impossibility, and the world will be very boring.